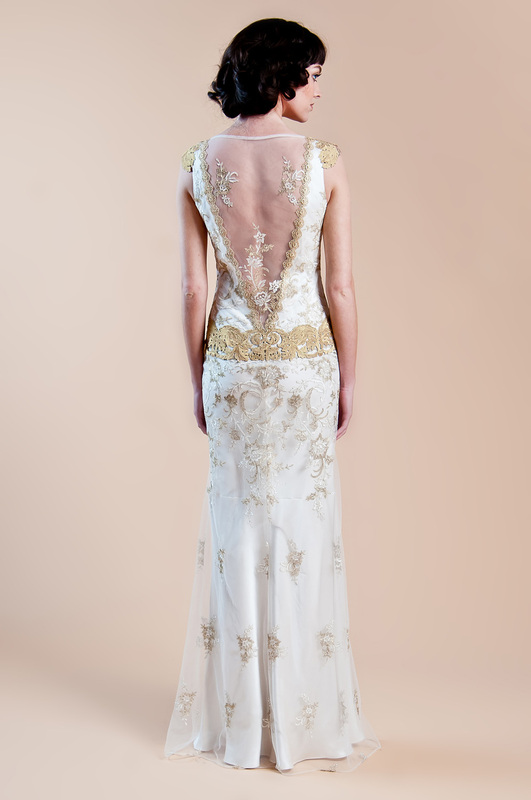 We have been following LA-based Claire Pettibone’s work since 2010, when her “Emma” line caught our eye in preparation for a museum exhibition. Ms. Pettibone’s “Emma” was a natural link with the white, diaphanous Neoclassical gowns found in Numerous historic costume collections or on vintage clothing sites. Many of us associate this elegant style with the writings of Jane Austen, brought to life in the recent, painstakingly researched fashions for film. After reviewing her recent 2012 Windsor Rose China line, we were again impressed with her ability to draw inspiration from an earlier era and transform it into our own. A personal favorite is “Deauville.” Ms. Pettibone’s own description sums up her knowledge of the period (in this case, the 1920s): cut, style, materials and finishing. “Gold embroidery on fine ivory tulle over a sumptuous pearl silk charmeuse wedding dress accented with gold guipure embellished drop waist, shoulders and neckline. My grandmother was quite the 1920’s bohemian…her first husband was a rum-runner during prohibition, and was mysteriously killed in a “motorcycle” accident. She never talked about him, and I was a grown woman when my mom shared the scandal that my grandpa (her father) was not grandma’s first love. I’ve been thinking about Anna Mae, and looking at the photos of her second wedding that we all thought was her first. She wore a beautiful mauve scalloped silk dress with a velvet sash at the hip, round spectacles and stylish Mary Jane’s. Grandma has long passed, but I have her wedding dress, the intricate embroidered linens she made by hand, her gold rimmed china with delicate painted roses…and a good dose of her free spirit. Don't forget to check out her singularly stunning lingerie collection!